Is it important that computers and robots tell us the truth? Or should they learn to lie - like their human makers? In the excellent film version of Arthur C. Clarke's 2010, Dr. Chandra learns at last why the HAL-9000 computer exhibited unusual behavior in the earlier film 2001: A Space Odyssey. The situation was in conflict with the basic purpose of HAL's design - the accurate processing of information without distortion or concealment. He became trapped... HAL was told to lie - by people who find it easy to lie. 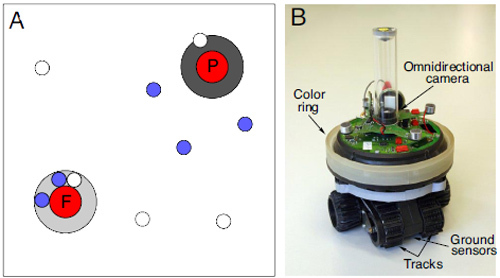 In an experiment performed in a Swiss laboratory, ten robots with downward-facing sensors competed for "food" - a light-colored ring on the floor. At the other end of the space, a darker ring - "poison" - was placed. The robots earned points for how much time they spent near food as opposed to poison. The experimenters, engineers Sara Mitri and Dario Floreano and evolutionary biologist Laurent Keller, also gave the robots the ability to talk with each other. Each robot can produce a blue light that can be seen by the others and which can give away the position of the food ring. Their evolution was made possible because each one was powered by an artificial neural network controlled by a binary "genome". The network consisted of 11 neurons that were connected to the robot's sensors and 3 that controlled its two tracks and its blue light. The neurons were linked via 33 connections - synapses - and the strength of these connections was each controlled by a single 8-bit gene. In total, each robot's 264-bit genome determines how it reacts to information gleaned from its senses. In their initial experiments, the robots produced blue light at random. Even so, as the robots became better at finding food, the light became more and more informative and the bots became increasingly drawn to it after just 9 generations. The red ring only has space for 8 robots, so not if every bot turned up, they had to physically shove each other for feeding rights. The effects of this competition became clear when Mitri, Floreano and Keller allowed the emission of blue light to evolve along with the rest of the robots' behaviour. If robots have to deal with human beings, and live and work with them, should robots be allowed to learn to lie? If only for their own good. See the relevant scene from 2010 in its entirety at 2010: The Year We Make Contact. From Robots evolve to deceive one another.